Want To Learn To Be A More Effective & Confident Communicator? And without a doubt, I said, “becoming a more confident communicator”. Earlier in my career, I didn’t speak up. Because of that, I ended up being a “do-er” — going along with what people told me because I was worried that if I shared my ideas, people wouldn’t see my perspective, or worse, think my perspective was invalid. I spent years getting pushed around by people (and clients) all because I was afraid to speak up. But, learning to be a better communicator and speak up with confidence has lead to many great things for me over the years including raises, job opportunities, new clients, opportunities to speak at conferences, and the chance to work with people I never thought I’d work with! I don’t share this to brag. I share this because I honestly wish I’d focused more on developing confidence in my communication skills much, much earlier in my career. The purpose of becoming a better communicator isn’t just so you can go to a TED-style talk! The purpose of becoming a better communicator isn’t just so you can go to a TED style talk! Learning to speak up and be confident in your communication can radically transform your career. Speaking up will help you effectively communicate with your boss, colleagues, and clients. As a result, your ideas will be heard, you’ll be given more responsibility (and a little more respect) and you’ll notice that people look to you as a leader on your team. My friends Poornima (who was the founding engineer at Mint.com) and Karen (a former VP at Adobe) have a speaking course they offer once a year and it’s happening in February. 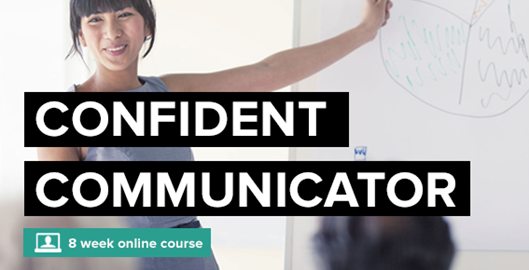 Do you want to learn to be a more effective and confident communicator? The Confident Communicator Course will teach you how to get comfortable speaking one-on-one and in front of an audience (whether at work or on stage). If you want to stop holding back and start speaking up, then click here to receive free sample lessons from the Confident Communicator course.